Mark VK5QI and David VK5DGR have been working on a slow scan digital image payload for the balloon system which transmits at 115kbit/s on a new downlink channel. 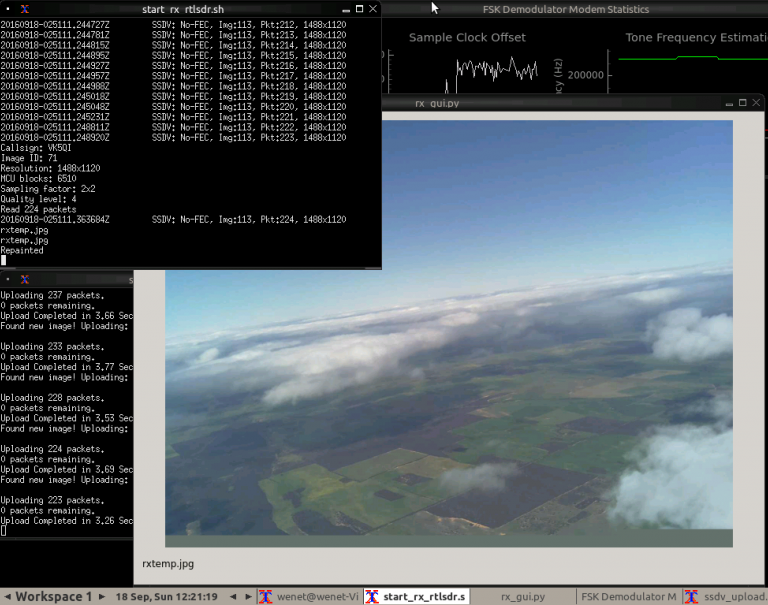 This system makes uses of the UKHAS SSDV server to stitch together images from packets uploaded by multiple receivers. You can read more about the system on Mark VK5QI’s blog. Unlike analog SSTV, SSDV sends down compressed JPEG images via some form of data link. Written by Philip Heron, the SSDV software converts a JPEG image into a set of packets which can be transmitted via a radio link and then re-assembled on the ground. Unlike regular JPEG images, if a packet is lost, SSDV will still produce a full image, albeit with some portions missing. At the meeting Mark and David will give you an insight into how it works. This system will be demonstrated in the field as well during coming Horus flights. This entry was posted in Meetings, Project Horus, SSDV by VK5GR. Bookmark the permalink.